Seniors: Ivory Homes affiliate is squeezing us out. 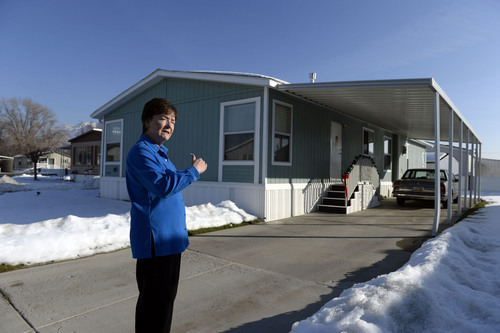 Midvale • Seniors who live in mobile home complex fear they may lose their houses. 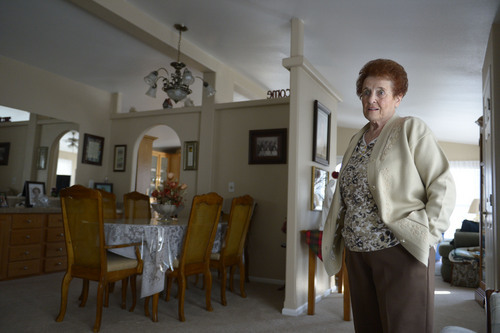 Francisco Kjolseth | The Salt Lake Tribune Shirlene Stoven, 77, a 20-year resident of the Applewood Park manufactured home complex in Midvale becomes emotional as she thinks about her elederly neighbors who can't fight a possible eviction after finding out plans for 186 apartments to be built on the nearly 8-acres of land where she currently lives. Stoven becomes angry when people refer to her home as a mobile home and says "there are no wheels on my manufactured home, it can't be driven away." The people who own the 56 homes have seen their rents go up since the place was sold to Ivory Homes. According to a Midvale memorandum, the developer plans to build an apartment complex. 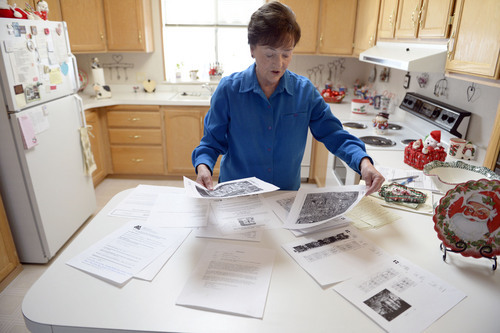 Francisco Kjolseth | The Salt Lake Tribune Shirlene Stoven, 77, overlooks the research she has done to find out the true intentions of the new owners of the Applewood Park in Midvale where she lives. The 56 home owners have seen their rents go up since the place was sold to Ivory Homes. According to a Midvale memorandum, the developer plans to build an apartment complex on the 8-acre parcel. 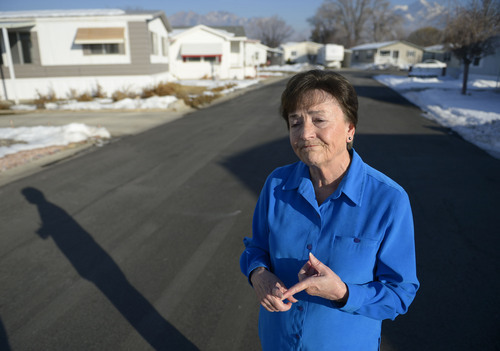 Francisco Kjolseth | The Salt Lake Tribune Shirlene Stoven, 77, a 20-year resident of the Applewood Park manufactured home complex in Midvale becomes emotional as she thinks about her elederly neighbors who can't fight a possible eviction after finding out plans for 186 apartments to be built on the nearly 8-acres of land where she currently lives. Stoven becomes angry when people refer to her home as a mobile home and says "there are no wheels on my manufactured home, it can't be driven away." The people who own the 56 homes have seen their rents go up since the place was sold to Ivory Homes. According to a Midvale memorandum, the developer plans to build an apartment complex. Francisco Kjolseth | The Salt Lake Tribune Ann Sharp, 81, an 11-year resident of Applewood Park in Midvale stands in her 1700 sq. foot manufactured as she talks about the challenges of seeing rents go up since the place was sold to Ivory Homes. According to a Midvale memorandum, the developer plans to build an apartment complex on the 8-acre parcel. Francisco Kjolseth | The Salt Lake Tribune Shirlene Stoven, 77, a 20-year resident of the Applewood Park manufactured home complex in Midvale says "I hope this is my last home till I go in the dirt" after finding out plans for 186 apartments to be built on the nearly 8-acres of land where she currently lives. Stoven becomes angry when people refer to her home as a mobile home and says "there are no wheels on my manufactured home, it can't be driven away." The people who own the 56 homes have seen their rents go up since the place was sold to Ivory Homes. According to a Midvale memorandum, the developer plans to build an apartment complex. Midvale • Dozens of senior citizens at Applewood Park fear that a company affiliated with Ivory Homes is trying to drive them out of their manufactured homes to make way for a large apartment complex near the TRAX line at 7500 South and 200 West. But Bolton Property Management owner Cory Tanner, who operates the park, labeled those fears as baseless. "These rumors are not true," he said. Tanner acknowledged the company raised rents in December and will do so again in June to bring the rates up to market value. Tanner refused to disclose the name of the landowner but said it was not Ivory Homes. He conceded that he got the property management job with the aid of Aaron Lombardo, who, Tanner said, worked for Ivory Homes. Reached by telephone at the Ivory Homes corporate office, Lombardo told The Salt Lake Tribune that Ivory Homes had nothing to do with Applewood Park. He said all inquiries should go through the property-management company. David Broadbent, Ivory Homes&apos; general manager, also referred questions about Applewood Park to Bolton Property Management. According to the Salt Lake County recorder&apos;s office, the 7.7-acre park was purchased in December 2011 by ICO Multifamily Holdings LLC for $2.5 million. ICO Multifamily Holdings is a branch of ICO, whose website lists Clark Ivory as chairman. He also is CEO of Ivory Homes. Both businesses list their address as 978 E. Woodoak Lane, Murray. In December 2011, ICO submitted a concept plan to Midvale that outlines a 186-unit apartment complex where Applewood now sits near the TRAX line. No further project plans have been submitted. A $70 rent increase in December and another $70 jump planned for June will make it difficult for many Applewood residents on fixed incomes, Stoven said. The rent, which was $320, will be $460  a 44 percent bump. She noted that many residents also are paying mortgages on their homes. "We spoke with each homeowner and asked them the impact of the rent increase. It was heartbreaking," she said. "For some, this is medicine and food money. It&apos;s just horrible what this is doing." It costs $10,000 to $20,000 to move a manufactured home (also known as mobile homes), Stoven said. But none of the owners of the 56 homes at Applewood can afford that. And there are scarcely any places that accept them. Georgia Buckley, Utah Coalition of Manufactured Homeowners, described what is happening at Applewood Park as a "financial eviction." "That&apos;s how they play the game," she said. "The residents will have to walk away from their homes. They can&apos;t afford to pay a lot of rent." Mark Lundgren is part of a nationwide coalition, called Residential Owned Communities, that seeks to help residents like those at Applewood. The organization helps residents purchase their parks, usually without government assistance. Lundgren said he called Ivory Homes corporate offices to inquire about buying the land and was put in touch with Ernie Willmore. Lundgren said Willmore told him the property was not for sale. Attempts by The Tribune on Friday to reach Willmore were not successful. Tuesday to ask for some kind of relief. Longtime Mayor JoAnn Seghini said she is sympathetic to the Applewood residents. "I know a lot of those people. They are retired and love it there," she said. "When I saw it was purchased by a company affiliated with Ivory Homes, I thought, &apos;Oh, wow.&apos; "
But the mayor said she is unsure how Midvale can help them. "Their rent has gone up and it&apos;s going to go up again," she said. "They&apos;ll be forced out. It&apos;s heartbreaking." The Applewood residents will not go quietly, Stoven said. "Everybody needs to realize that one day you&apos;re going to be a senior," she said. "We need to educate the world to take better care of our seniors."